How did you access the Isometric Panel? It is not available on my View > Studios list where it should be! If it was there for you would you be able to zip up and attach a copy of your %AppData% Designer Beta folder please? Hi Sean, accessed through the grid and axis manager. Ahh got it cheers! It should actually be available on the View > Studios panel, but is not currently available! However I can see the Grid Settings being cut off, so will also get that passed on to development. Brilliant....I was looking for that last night..couldn't see a keyboard shortcut for it! Also you can miss it as the new panel sometimes pops up under the main grid and snapping panel. I can't find it here with this tip. Tried both 'Create plane set' on and off. Also when I move the 'grid and snapping panel' away (or close) it's not behind it. Am I missing something? This trick was helpful for me. 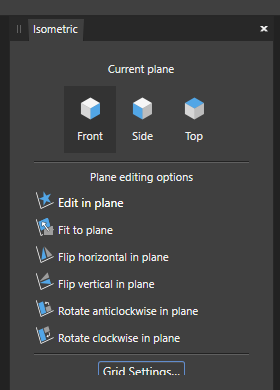 A brief tutorial about the correct use of the 'Edit in plane' could be useful. So now, how can I find info about the new construction mode? Is there a tutorial in some place. Thanks. [EDIT] I found the help guide and now I have a better idea of how to use this mode. Great!